Welcome to the Magic Pill — your daily dose of get-up-and-go! 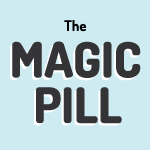 Every episode of The Magic Pill is filled with 10 minutes of new science, big ideas, quick tips, and some uplifting music. It's all about helping to shift your mindset from seeing exercise as a chore and a pain to seeing it as a gift, a treat, even a joy. Sign up here anytime to get the podcast delivered to your email inbox for 21 days. We'll email you a new episode every morning along with inspirational stories, tips and music to help get you moving. Eddie is a leading expert on the medical importance of exercise, and Carey is a longtime health journalist swayed by the studies she wrote about. Both believe in solid science and strong storytelling, and want to help you cut through the noise to what matters most about exercise: Doing it — even just a little — and figuring out what works for you, so that you’ll keep doing it. For questions you can contact commonhealth@wbur.org.